Fed by the melt waters of the Daly Glacier, the Takakkaw Falls which are situated in British Columbia's Yoho National Park are an impressive sight as water plunges 254 metres in a free fall. The spectacular Takakkaw Falls in Yoho National Park are approximately 380 metres high from the top, falling the first 126 metres in steps before making the final free fall of 254 metres. It is the highest waterfall in the Canadian Rocky Mountains and the second highest waterfall in Canada. A portion of the paved road which provides access to the Takakkaw Falls features two sharp and steep switchbacks making it a challenging drive (and not one for towing vehicles or extra long vehicles) but the reward is well worth the effort. 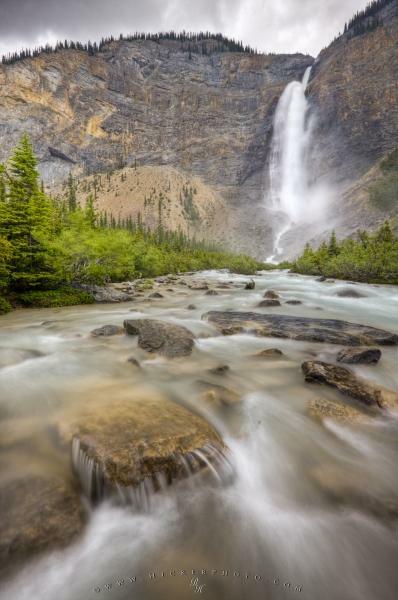 The waterfall is definitely a must see when touring through Yoho National Park in British Columbia. Yoho spans an area of 1310 square metres of the Canadian Rocky Mountains and is bordered by Banff National Park and Kootenay National Park. in Yoho National Park, British Columbia, Canada. This picture is part of the photo album "Waterfall Pictures" - there are more beautiful images waiting for you.